Put away the patch, throw out the gum, and smoke ‘em if you got ‘em. Today is the anniversary of the 1600 death of Jean Nicot de Villemain, namesake of your favorite addiction. While other Frenchmen have since been described as colorless, oily, acrid, and transparent, nicotine’s namesake was also a diplomat and a scholar. Ah, young love. In 1559 in Portugal, the regents for fresh-faced six-year-old French princess Marguerite de Valois and strapping five-year-old King Sebastian of Portugal discussed a pre-prepubescent love connection between these two naifs. Jean Nicot de Villemain was the French ambassador to Portugal in charge of negotiations. Though the royal union was ultimately unsuccessful, Nicot did manage to kindle France’s love affair with smoking. He sent back tobacco. Native Americans had been smoking tabaco ritualistically for literally thousands of years before Christopher Columbus and crew were introduced to it by the islanders of Hispaniola. On Columbus’s second voyage to the New World, a tribe of Haitians demonstrated the sniffing of dried tobacco leaves as snuff. Though it is believed that French monk and explorer André Thévet may have been the first person to introduce the tobacco plant to Europe in the early sixteenth century, it was Nicot who garnered fame after sending plants and seeds to the French court. It was snuff, in particular, that turned queen mother Catherine de’ Medici’s head. She used it medicinally to treat her son’s migraines, and the Parisian elite soon could not get enough of this new wonder drug. Part of the often poisonous nightshade family, by the late 1500s all tobacco plants fell under the genus Nicotiana, in honor of the French diplomat. It took more than two hundred years for nicotine itself to be isolated by chemists as a poison in 1828, and there was an early forensic case in 1851 where Belgian count Bocarmé was found guilty of murdering his brother-in-law with tobacco leaf extract. Created from dried tobacco leaves, a typical cigarette contains approximately one milligram of Nicot’s legacy as a stimulant, which is believed to be largely responsible for smoking’s addictiveness. In addition to its appearance in cigars, cigarettes, and pipes, nicotine was widely used as an insecticide into the twentieth century. Outside of recreational and pest-control use, tobacco leaves are also used to induce vomiting in Brazil, to prevent baldness in Colombia, to ease painful menstruation in Cuba, to treat snake bites in Ecuador, to repel insects in Iran, and to induce labor in Tanzania. 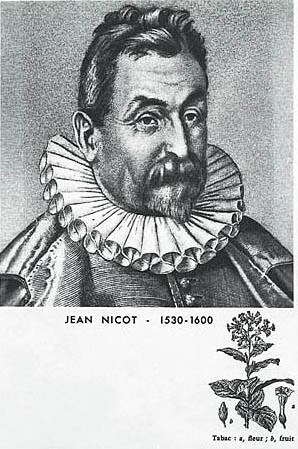 It is impossible to estimate how many lives Jean Nicot de Villemain has touched over the centuries, whether in leaf, gum, or even patch form. Despite being a true intellectual and the creator of one of the very first French dictionaries (published posthumously in 1606), it is the addictive weed for which he will always be remembered. His (perhaps self-promoting) dictionary defined nicotiane as “an herb of marvelous virtue against all wounds, ulcers, lupis, or other eroding ulcers of the face, herpes, and other such things.” He died in 1600 at the age of seventy.